ADJUSTABLE- Extendable chain. Nickel free. 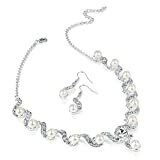 Brand new shiny silver and pearl colour diamante necklace and earring set. Ideal for wedding or bridal jewellery, prom nights or any other special occasion. Part of our classic fashion jewellery range. Beautifully crafted with matching earrings. Stand out from the crowd with this necklace at this amazing price. The necklace is beautiful for all occasions whether in the office or on the town it will compliment any dress perfectly. Look like a million dollars for an affordable price.